Chase is a good lender to look into if you are already a customer or are sure that you want a line of credit and not a loan. Their terms are comparable to other lenders we looked at, and their customer service is among the best in the industry in terms of ability to help, knowledge, and accessibility. Customer service is above industry standard, and their loan officers can help answer your questions and point you in the right direction. Chase does not offer home equity loans, only lines of credit. 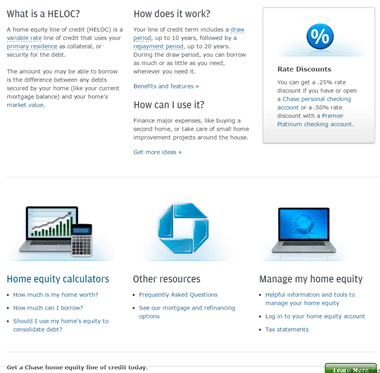 Chase is one of the biggest home equity lines of credit providers in the country. As a result, they have a wealth of experience in the area, which really shows when you discuss your home equity line of credit, or HELOC with a Chase Bank loan officer. Chase interest rates follow the prime rate, but tend to be capped at a higher rate than many of the other lenders that we’ve reviewed. Interest rates are usually variable, but you can request a fixed interest rate for certain periods of time for some of their home equity line of credit products. However, you should be aware that doing so may incur additional fees, so be sure to discuss the different options with your loan officer so that you can be sure that you’re getting the best deal on your home equity line of credit. Chase offers some of the best loan-to-value ratio products that we looked at. They determine loan to value by taking the current value of your property, and using it to divide what you still owe on your mortgage. You can use the tools on their site to find out how much credit you can qualify for, or if you are even eligible at all. This feature was well-reviewed by customers as it helped them rapidly determine if Chase was an organization they should keep looking into for their home equity lines of credit. Chase does not offer traditional home equity loans, which makes them somewhat difficult to compare to other lenders. However, their lines of credit are some of the most flexible in the industry. You can negotiate draw periods, repayment periods, periods of fixed interest, and many other aspects of your loan. The loan officers we worked with at Chase Bank were helpful and able to explain how each modification to their standard line of credit products would impact the structure of the product. This is impressive given how complicated these products can be, and it shows why Chase is the largest home equity line of credit provider in the country. Customers have reported generally positive experiences when dealing with Chase. This is in part because their website has a number of tools that provide you the basic information up front to determine if you should continue to the application process, and help you get a handle on what products you might be interested in. Their LTV calculator was incredibly easy to use, and they have a large number of physical branches that you can walk into in order to get help with your account. Moreover, they have a number of handy checklists available on their website so you’ll know what information you need before you start the application process, which can be a huge time saver. 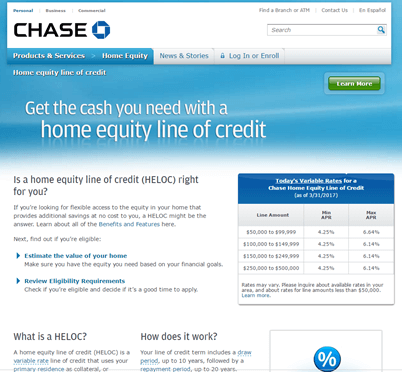 Chase Bank is a good lender to look into if you are looking for a home equity line of credit. They offer competitive rates and a number of flexible products, which makes them among the best home equity line of credit providers that we looked at.